Long priced out of home ownership, Ross is now being squeezed out of the rental market as the country’s biggest population boom since 1957 sends prices surging in Canada’s biggest city. The 56-year-old unemployed office worker pays $1,026 for her one-bedroom apartment. Her savings and unemployment insurance are running out and she’s been looking for a cheaper place but units that were in her price range only a few years ago have nearly doubled. “It’s so stressful and I suffer from heart palpitations and anxiety,” said Ross from her 24th-floor apartment where hanging plants and bright cushions create a refuge in a dingy building in constant combat with pest infestations. As U.S. President Donald Trump has clamped down on high-tech visas and amped up the anti-immigration rhetoric Prime Minister Justin Trudeau has taken a more welcoming approach. Canada took in a record 413,000 people from abroad in the year through July 1, pushing population growth to 1.4 per cent, the fastest in the Group of Seven. Almost 100,000 of those immigrants have landed in Toronto in the past year, including refugee claimants, a surge in international students and workers chasing thousands of new high-tech jobs at companies like Uber Technologies Inc. and Microsoft Corp. Add in those who can’t meet stricter mortgage regulations after house prices jumped 60 per cent in the past five years and it’s been an all out war for rentals. Supply isn’t beginning to keep up. Condo completions have been running near a five-year low of about 10,000 units, according to Altus Group Ltd. And only about 60 purpose-built rental buildings have been constructed since 2005, bringing a meager 11,620 units to market when the city’s been creating about 17,000 renter households a year, according to property research firm Urbanation Inc. The result has been skyrocketing prices. 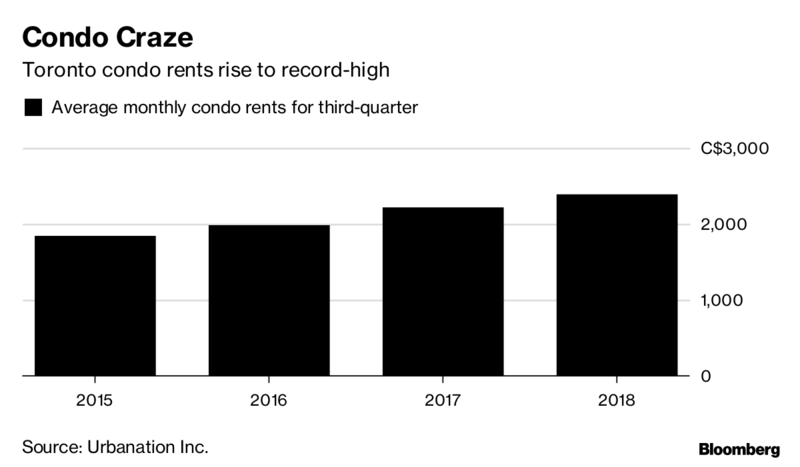 Condo rents soared 7.6 per cent to an average $2,385 in the third quarter over the same period a year ago and were up 17 per cent for newly available purpose-built units, according to data from Urbanation. Meanwhile, the apartment vacancy rate sits at about 0.5 per cent. That might still be a bargain compared with cities like San Francisco, where a one-bedroom went for US$3,333 in 2017 or New York where it cost US$2,811, though prices in those cities have stabilized over the past year. Those on the bottom rung of the housing ladder are getting hit the hardest. “Homelessness is growing, couch-surfing is growing and this will have a lot of pressure on families and on the city itself,” said Alejandra Ruiz Vargas, a member at Association of Community Organizations for Reform Now Canada, which represents low and moderate-income families. With asylum claims to Canada also doubling in the past year, it’s getting harder for refugees to find housing too, said Lucy Chaimiti, executive director at Adam House, a refugee support group. It usually takes people four to six months to find housing after arriving in the city and they usually end up spending about 85 per cent of their social assistance income on housing, she said. City and provincial policymakers are beginning to wake up to the brewing affordability crisis. In an election dominated by housing last month, Mayor John Tory pledged to bring 40,000 affordable rental units to the city over the next decade, offering city land, cash incentives and to cancel or defer development charges and taxes. While there are rent controls on existing units, the new provincial government has dropped them on new construction in an effort to entice development. Some builders such as Tricon Capital Group Inc. have already jumped on the affordable bandwagon. Affordable housing needs to be created for those who “are not investment bankers or cannabis entrepreneurs,” RioCan REIT Chief Executive Officer Ed Sonshine said in an earnings call in October. RioCan is interested in getting into the market, but government incentives needs to be higher, he said in a phone interview. Toronto meanwhile, needs to get more creative to broaden the types of housing available, said Florida, at University of Toronto. Companies could focus on housing that uses pre-treated timber or modular construction, speedier, cheaper home-building alternatives. Meanwhile, Ross is running out of options as she scrambles to secure future housing. She’s anxiously awaiting to hear back from the lottery which is offering up a one-bedroom unit for $962 including utilities in the redeveloped Regent Park. The former crack haven is now a mixed-used neighbourhood that includes affordable rentals and market-priced condos alongside sports fields, an aquatic center, community meeting spaces and cafes. The city will likely need dozens of such neighbourhoods to handle the influx in newcomers.